UCLA Health is home to some of the most technologically advanced hospitals in the world, providing an extraordinary opportunity for the advancement of medicine and improving patient care. Our physicians are leaders in a variety of minimally invasive and robotic procedures, some of which are listed below. Dr. Isaac Yang, expert neurosurgeon at UCLA, discusses the latest advancements and treatments for meningiomas. We're introducing you to just a few of the neurosurgeons pioneering new techniques improving and saving lives everyday at UCLA. With a staff of more than 30 in the department of neurosurgery, we are pushing the boundaries and constantly evolving our life-changing research. Ronald Reagan UCLA Medical Center Becomes Worlds First Hospital to Introduce Remote Presence Robots. A new breed of robot allows physicians to virtually consult with patients in the UCLA neurosurgery intensive care unit, even if they are miles away. The physician consults with patients, family members and other caregivers in two-way conversations that are face-to-face encounters thanks to cameras built into the robot and the physician's computer. New robots help doctors keep an eye on patients, even when they can't be bedside. A team of UCLA neurosurgeons and head and neck surgeons are helping to pioneer a minimally invasive, endoscopic surgical approach that offers greatly improved visualization and freedom of movement to remove pituitary tumors more confidently and precisely. This breakthrough surgical approach avoids "blind" tumor removal techniques, which can lead to incomplete tumor resections and/or injury to critical adjacent structures. 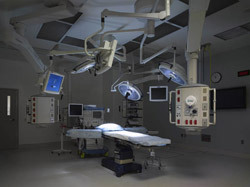 In addition to the standard (though most-up-to-date) operating-room equipment, Ronald Reagan UCLA Medical Center's 23 ORs are equipped with advanced audio and high-resolution video-conferencing capabilities, so that medical students at home or colleagues around the world can observe surgeries in real time. There is one place you want to be. The Ronald Reagan Medical Center at UCLA. The equipment is cutting edge. So cutting edge, it's not used in most ERs...anywhere.